I now have color coded icons for the gauge stations on the front page map. There are the normal blue road cameras and green gauge stations. In addition to that there are some red gauge stations. The red ones are places where the Klamath Tribes in-stream claim is higher than the current flows. Currently I have the tribal claims for 7 reaches coded in. 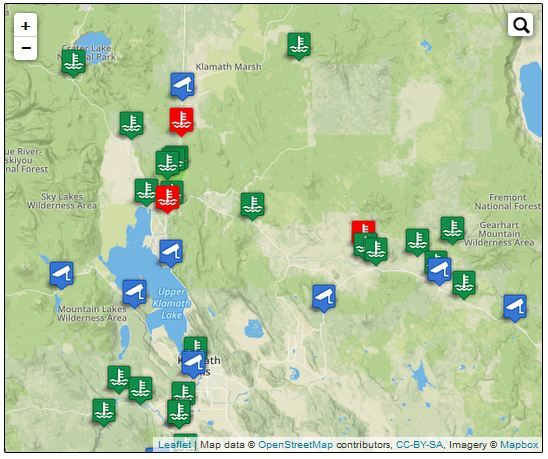 A lot of the claims do not line up with gauge stations and most of the gauge stations on the map are outside of where the Klamath Tribes effect things. More gauge stations have been added since I coded in the claims. As I get some time I will look up the new stations and see if they line up with any of the claims. As a side note if a person would like other claims, inside or outside Klamath area mapped contact me and I would likely be game to add them to the map. As normal a big thanks to for their icons and great tools to customize the icons.